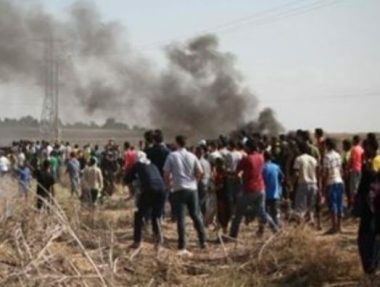 Israeli soldiers attacked, on Friday evening, Palestinian protesters, marching on their lands near the border fence, east of Gaza city, wounding one. Media sources said the soldiers, stationed behind the border fence, east of Gaza city, fired many live rounds, rubber-coated steel bullets and gas bombs at the protesters. They added that a young man was shot with a live round in his leg, and suffered a moderate injury, before he was rushed to a nearby hospital.